Salim Al-Wasity received a BSc Degree in Computer Engineering in 2004, and MSc Degree in Computer Engineering/ Intelligent Control in 2007. Between 2008 and 2013 he worked at School of Engineering - University of Wasit (Iraq) as a lecturer and also as a head of Quality assurance division in the School. 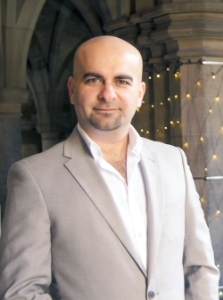 In 2013, he moved to University of Glasgow to start his PhD at College of Science and Engineering, funded by the Higher Committee for Education Development in Iraq (HCED). His research interests focus on understanding the neural representation of different motor actions and modalities like action observation, motor imagery and action execution using EEG and fMRI (3T), and also employing different fMRI Neurofeedback approaches to alter that representation. Salim will visit Brain Innovation in Maastricht (The Netherlands) to improve our abilities to perform decoded fMRI Neurofeedback at 3T and to extend these capabilities to the new 7T scanner in Glasgow. 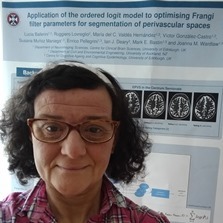 Lucia Ballerini is expert in image analysis who has developed novel image analysis algorithms and demonstrated their successful applications in many domains. She has published about 100 peer-reviewed scientific articles. In 2015 she joined the Centre for Clinical Brain Sciences at the University of Edinburgh and started working on stroke, ageing and dementia. Her first contribution to brain imaging is a prototype quantitative computational method for assessing Perivascular Spaces (PVS). The work has been presented at SINAPSE ASM and published in Elsevier Procedia Computer Science. Lucia will visit Prof. Sandra Black's team at Sunnybrook Research Institute, one of the few groups developing computation PVS quantification. This exchange will contribute to harmonizing their methods, exchanging ideas, and applying their resulting method to data sets both from Edinburgh and Toronto. 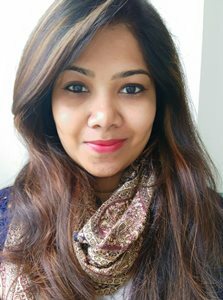 Anu Chandra is currently pursuing her second year of PhD under the supervision of Dr. Christine Demore, Dr. Graeme McLeod, Prof. Zhihong Huang and Prof. George Corner, at University of Dundee. The research study is funded by the National Institute of Academic Anaesthesia (NIAA). She is interested in integrating clinical and engineering methods together and to bring innovative ideas into her research which can help her in developing the imaging device to improve the patient safety during regional anaesthesia. Anu holds an undergraduate degree in Biomedical engineering from University of Calicut, India in 2010 and completed her Masters in MSc Biomedical engineering from University of Dundee in 2012, followed by her MSc by research master’s degree in High Resolution Ultrasound Imaging for Clinical and Pre-Clinical Applications in 2015. She will be commencing her PECRE exchange visit at the Sunnybrook Health Sciences Centre, Toronto, Canada where her project is titled “Improved patient safety using ultrasound during regional anaesthesia” with Dr. Christine Demore. The research study mainly focuses on improving the visualisation techniques of region of interest and the surrounding structures for regional anaesthesia and epidurals, which can then increase the efficacy of the procedure performed. Access to Visualsonics real-time microultrasound imaging system is an advantage, made possible by Dr. Demore. 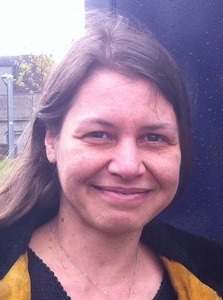 Clarisse de Vries is a first year PhD student at the University of Aberdeen. Before this, she got her BSc in Electrical Engineering at Delft University of Technology in the Netherlands and her MSc in Medical Physics at the University of Aberdeen. Her PhD project is in the field of neuroscience. She is investigating which early life circumstances have a positive or a negative influence on brain health in late life. She is quantifying brain health by deriving various metrics from participants’ MRI images. During her PECRE exchange visit at the Neurocognition, Early Experience, and Development (NEED) Lab at Columbia University she plans to examine how a family history of neurodegenerative disease affects brain volumes and cognition of children and adolescents between 3 and 20 years old. Answering this question can help determine whether previously found brain and cognition differences in adults start in childhood or are caused by differential decline in adulthood. Adalberto Ferrari is a Medical Biotechnologist graduated from Milan, Italy. He is currently a Postgraduate Student doing a PhD in Medical Sciences at the University of Aberdeen. Being part of the Aberdeen Biomedical Imaging Centre (ABIC), his area of research involves Molecular Imaging applied to oncology; in particular, he supports the use of PET imaging as means for non-invasive evaluation of a tumour's heterogeneity and metabolism through the use of current and novel PET radiotracers, in order to set up a proper therapeutic strategy. 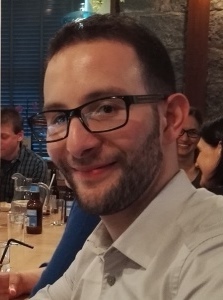 For his PECRE exchange visit, Adalberto will attend the PET Research Core facility at the Stony Brook University of New York, where he will have a unique opportunity to further develop his skills in the field of PET imaging, making his expertise in Nuclear Medicine more complete. He also expects that his exchange experience will foster collaborations in the field of Molecular Imaging between the main Scottish imaging research institutes and the rest of the world. 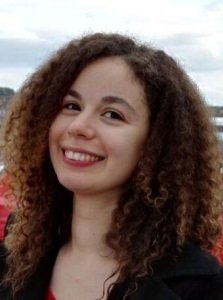 Elvina Gountouna is currently a Research Fellow in the Nicodemus group in the Institute for Genetics and Molecular Medicine in the University of Edinburgh. She has a particular interest in advancing the understanding of risk and resilience factors for psychiatric disorders, especially in the context of the social environment, using a multidisciplinary approach encompassing information from the genetic, neurobiological and behavioural domains. Her PECRE exchange visit will take place at the Lieber Institute for Brain Development, Johns Hopkins School of Medicine in Baltimore, a world leading group in psychiatric research, with unique resources and expertise in brain imaging. There she will have the opportunity to work with Dr. Caroline Zink along with Dr. Nicodemus in the development of a novel task for functional MRI utilising naturalistic stimuli and related analysis techniques for the study of social cognition in psychiatric disorders, as well as plan further collaborations.